Quick assembly, delivered on time and in good condition, top has nice smooth finish, can be easily matched with most chairs.. I'm pleased. It actually is a very pretty finish. Everything was packed very well and came with no scratches, which was a concern of mine ordering online. 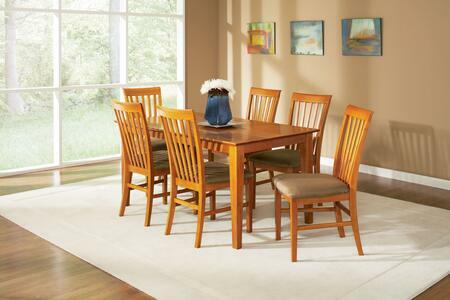 I'm looking at ordering two more chairs or possible the matching bench from the same brand. If you’re looking for different eye catching and unique you just found it, Shaker Dining Table from Atlantic Furniture blends with everything. A lot of people compliment my table. We use it every day and still in love with this table. This table is exactly what I hoped it would be! The finish color is exactly as pictured. Wood is beautiful. Rustic but not rough. Will be ordering two side chairs to go with it. My wife wanted a glass table for our dining set, and this is what I selected among several options. This was not only the cheapest, it is Elegant, beautiful and good quality. Love the finish and the glass is a solid. I really cannot say it enough! It's a very sturdy, solid table and I look forward to having many more family meals around it. The leaf is icing on the cake. We bought it for a vacation home and want to buy another for our home. I was so happy to have found it on your website. It's just my style. It is the perfect size for us eat in kitchen. Love my Shaker Collection table from Atlantic Furniture. I am thrilled with my table. Have been looking for a while and not able to find anything this size in the stores. Love the leaf option, thou for more guests. Well built, sturdy, simple and classic. When you order online you have this slight uneasy feeling you're not going to like it when the product arrives. This was not the case with my table. This table is extremely durable Beautiful finish, and elegant. The pedestal base is substantial and the table looks a lot more expensive than what I paid. Glad I took the plunge. It was very simple to put together and my husband assembled it very quickly. I like it even better than the one I had before.